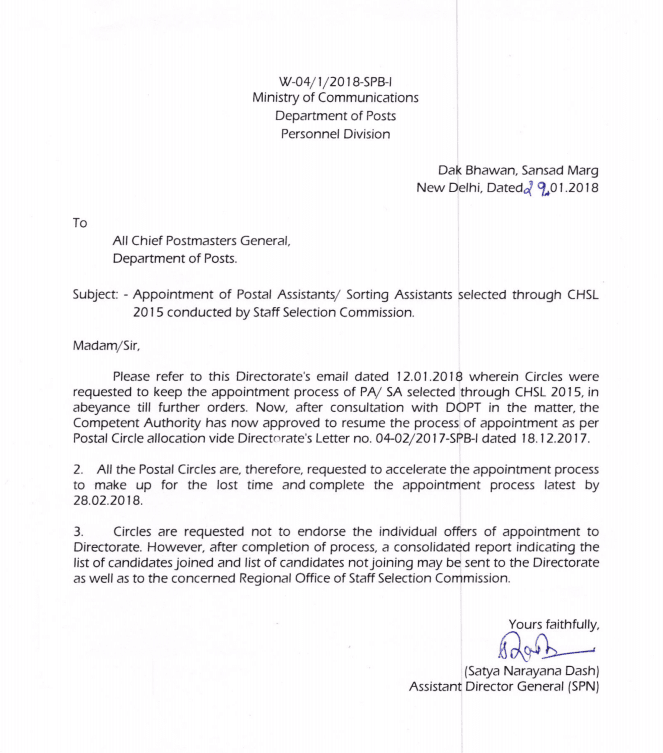 Please find below a letter issued by Department of Posts (Personnel Division) to all chief postmasters General directing them to resume the joining process and complete the appointment by 28.02.2018. You may read the excerpt below or view the image. Subject: – Appointment of Postal Assistants / Sorting Assistants selected through CHSL 2015 conducted by Staff Selection Commission. 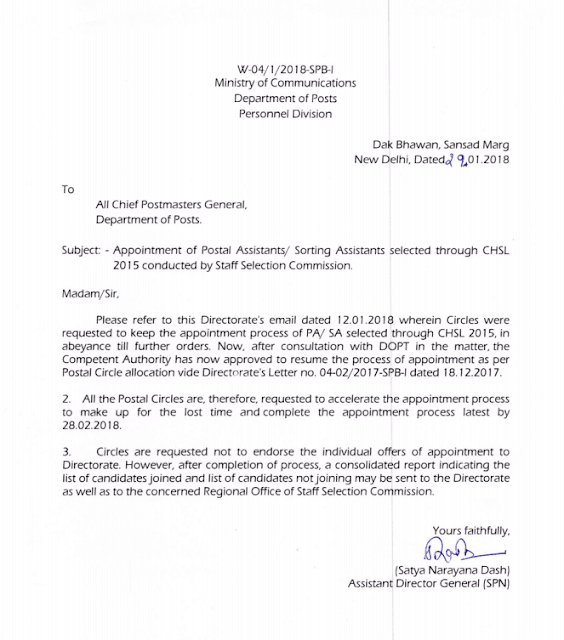 Please refer to this Directorate’s email dated 12.01.2018 wherein Circles were requested to keep the appointment process of PA/selected through CHSL 2015, in abeyance till further orders, Now.after consultation with DOPT in the matter, the Competent Authority has now approved to resume the process of appointment as per Postal Circle allocation vide Directorate’s Letter no. 04-02/2017–SPB-l dated 18. 02.2017. 2. All the Postal Circles are, therefore, requested to accelerate the appointment process to make up for the lost time and complete the appointment process latest by 28.02.2010. 3. Circles are requested not to endorse the individual offers of appointment to Directorate However, after completion of process, a consolidated report indicating the list of candidates joined and list of candidates not joining may be sent to the Directorate as well as to the concerned Regional Office of Staff Selection Commission.